E2B v1.56 Beta6 and later versions will now recognise the .iso64xxxxx file extension and will only list the ISO in the menu if the system contains a 64-bit CPU. This means that if you boot from a 32-bit CPU, you will not see the menu entries for any 64-bit ISOs if you simply use a .iso64 file extension for them. Note that this does NOT apply to ISOs under the \_ISO\WINDOWS folder (the Windows Installler ISOs) - for these you must use the .ISO file extension. Most of the .iso family are supported - e.g. .iso64, .iso64PE, .iso64PE01, .iso64mem, .iso64win, .iso64linux, .iso64grub, .iso64force, .iso6401, .iso64dd, .iso64gz, .iso64e0, .iso64meme0, .iso64pup and .iso64WB. You can prevent all the file extensions from being listed in the menus by using set EXTOFF=1 in your \_ISO\MyE2B.cfg file. Note: If your menu uses FASTLOAD, you do not need to Refresh the menu when you boot on a different 32/64 bit system. The menu will test for a 32-bit or 64-bit CPU each time it is loaded. If you want to install Windows Vista/7/8 etc. in MBR\CSM mode, you can just copy the Windows Installer ISO to the correct E2B USB folder, and you can copy over your own Unattend.xml files to the same E2B folder. E2B will then allow you to pick any one of these XML files so that the Windows install uses the correct Product Key (which is required by Win8), or is semi-automated or even full-automated, depending on what is in your Unattend.xml file. However, if you use MakePartImage to convert the Windows Installer ISO into a partition image (.imgPTN file) so that you can both UEFI- and MBR\CSM-boot from it, you will not have any of the E2B features to choose your own XML file or automate the install. I have therefore detailed some instructions here on how to add your own AutoUnattend.xml file to a partition image .imgPTN file. If you are using an E2B Removable type of USB Flash drive, then you just need to copy the AutoUnattend.xml file to the root of the image. However, if your E2B USB drive is a Hard disk or 'Fixed disk' type, then this will not work because Windows only auto-detects a \AutoUnattend.xml file on removable media like Flash drives, floppy disks (remember those?) or DVDs. Instead we need to tweak the files inside the \sources\boot.wim file. If you follow the instructions, you can even offer the user a choice of XML files to use before Windows Setup runs. We can use grub4dos to detect the CPU bitness using the is64bit command. A number of people have hit the problem of using Windows Install ISOs which have non-standard characters in the ISO filename, such as ( and ) and ! and & etc. This caused a problem with some of the Windows .cmd scripts which are automatically run when Windows\WinPE boots. also, I have found a way to suppress the 'Press any key to boot from CD or DVD' prompt which you may see when you boot from some Windows ISOs. This message is caused by the \boot\bootfix.bin file inside the ISO file. If the bootfix.bin file is not present then the code inside it which prompts you to press a key is not run. I found a neat way to prevent this from being run - see here for details. Please let me know if you find any issues with this Beta version. Quite a few changes in version 1.55, thanks to many others for ideas, improvements, language files and bug reports! F1 Help Main menu added (English only). F1.cfg help file can be translated into other languages. \_ISO\e2b\grub\menu.lst code change to work around incompatibility issue between AMI BIOSes and MyDigitalSSD OTG USB drive - grub4dos losing all variables! Affects HP Compaq dx2400 microtower, Asus M4A89GTDPRO-USB3 motherboard, Asus x550ca - all have American MegaTrends BIOS. Exact cause still under investigation. Portuguese language STRINGS.txt added (thanks Carlos). Romanian language STRINGS.txt added (thanks Anto). French language STRINGS.txt added (thanks Nicolas). New \_ISO\docs\mythemes folder added - supports adding a $Change_Theme.mnu menu file to the Main menu. Read the ReadMe.txt file in the folder for more info. .cfg file extension support added - can now switch themes by copying a MyE2B.cfg-style file to a menu folder. \_ISO\docs\Sample E2B Templates folder name changed to Templates due to path length limitations in grub4dos. If updating, you can delete the old Sample E2B Templates folder. Latest grub4dos grldr versions included in E2B (important long-standing NTFS bug fixed in new version). Longer paths allowed for splashimage, etc. see http://grub4dos.chenall.net/categories/downloads/ for details of fixes. EXTOFF variable added for MyE2B.cfg file - if set to 1, file names are listed in the menu without their file extension. Various small changes to Qrun.g4b, English STRINGS.txt and other E2B files. You can change or remove the menu ► arrow marker symbol which indicates the highlighted menu entry, using a new grub4dos feature (see Sample_MyE2B.cfg). If you prematurely abort an .imgPTN file selection, the 4th partition is now cleared instead of leaving it switched in. Sample_MyE2B.cfg has sample code to detect host display resolution and choose different wallpapers. linux fmt.sh script revised so works with older bash shells (thanks Todd). PTN_LOG1_Menu.mnu - If you have an E2B drive with a Logical partition, you can boot from files on that partition with this menu. As always, let me know if you find any problems - there are many 1000's of happy E2B users who don't have a problem, so if you do find a problem ,it will probably be due to an incompatibility with your particular system or payload file. Many of these sorts of problems can be worked-around or fixed, but only if you let me know using the Contact Me page on the www.easy2boot.com website! Let me know what you think of the new changes. A problem with a wireless mouse and USB 3.0 flash drives was driving me crazy! If you have read my blog, you may remember that I had built a new system a few months ago - see here. On the whole I have been very pleased with the system. It is quiet and fast. The front panel has four USB ports, the top two are USB 2.0 and the bottom two are USB 3.0. I specifically wanted this Cooler Master N600 case so that I could have convenient access to both types of ports. I needed easy access because, of course, I need to test Easy2Boot USB drives a lot! The only problem that I have been having for months now was with the Anker Wireless Mouse and dongle that I had plugged into one of the front panel USB 2.0 ports of my new PC. Most of the time the mouse+dongle worked just great, but I noticed that whenever I plugged in a USB 3.0 Flash drive into the USB 3.0 port on the front panel, the wireless mouse started to respond in an unreliable and jerky fashion, particularly just after the USB 3.0 Flash drive had been connected (and Windows would start to access\scan it). If left it for a few minutes, the wireless mouse response would improve slightly, but it still gave me trouble (I humbly apologise for any physical harm that I may have caused to the poor, long-suffering creature and I also apologise for any abusive comments that I may have shouted at it in sheer frustration whenever the cursor started to behave erratically)! My first thought was that perhaps the single AA battery in the mouse was getting flat, but I found that if I changed it for a new one every week, the response did seem to improve slightly, however it still wasn't perfect and it soon started to play up again. As always, as soon as I unplugged the USB 3.0 Flash drive - the mouse responded perfectly! 2. The issue only occurred when I connected a USB 3.0 flash drive to the USB 3.0 front port - if I connected the same flash drive to the other spare USB 2.0 front port or rear USB 3.0 port - no problem! 3. If I connected a USB 2.0 Flash drive to a front USB 3.0 port there was no problem. 4. There was no difference in behaviour, whether I connected the USB 2.0 wireless dongle to the front USB 3.0 port or to the front USB 2.0 port. 5. If I replaced the wireless dongle with an ordinary wired USB 2.0 mouse it worked fine. 6. The wireless dongle worked in the rear USB ports (but this was inconvenient if I wanted to use the dongle in another system, because I could not easily get access to the rear of the PC to remove it). Over the last few months, I have tried updating the USB chipset drivers of my Haswell mainboard but to no avail. Today however, I Googled for 'USB 3.0 wireless mouse jerky' and found this thread. It said that USB 3.0 signals can cause interference with the 2.4GHz wireless mouse dongle and that I should separate the USB 3.0 flash drive from the USB 2.0 wireless Bluetooth dongle. It cited an Intel PDF on the subject here (esp. see 4.3). So I got out a spare, well-shielded USB 2.0 extension cable and used it to connect the wireless dongle to the same USB 2.0 front port as before. Fig. 1 Before (mouse was jerky) - and - Fig.2 After (works perfectly)! The result was (drumroll......) >>> the wireless mouse now works fine! Even if I taped the wireless dongle directly on top of the USB 3.0 Flash drive it still worked without any problems! This suggests to me that Intel's assumption that the problem was caused by radiated interference is not correct. It seems to me that the problem is caused by electrically transmitted noise. Another test was to completely wrap the USB 3.0 Flash drive in tin foil and earth the foil to prevent any wireless interference (without using an extension cable). Again this proved ineffective. I also tried inserting a 1m USB 3.0 extension cable between the Corsair GT USB 3.0 Flash drive and the front panel USB 3.0 port with the wireless dongle directly plugged into the USB 2.0 port (i.e. 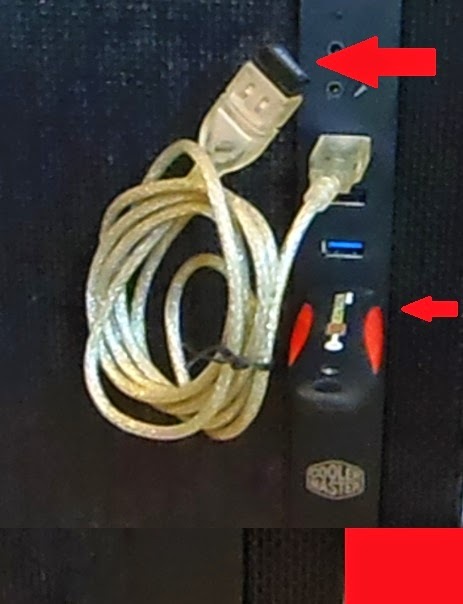 as in Fig.1 but using a USB 3.0 cable to connect the Flash drive). I deliberately placed the flash drive on top of the wireless dongle so it would cause maximum radiated interference - but again the mouse worked fine! So it seems that merely using a USB extension cable fixes the problem - this may be because the RF frequencies in the USB 3 data lines or power lines are being absorbed by the USB cable's ground shield, so that less electrical RF noise get's back to the front panel PCB via the signal/data wires. So I am not at all convinced that this is a case of wireless interference - more likely, it is a case of poor grounding and isolation on the USB port PCB that is inside the front panel of the case. It may be that a few high-frequency decoupling capacitors sprinkled around the USB port PCB may fix the problem, but I am going to leave that for another day! Getting rid of high-frequency noise such as 2.4GHz is tricky and often a multi-layer PCB with close ground-Vcc planes is the only way - this would mean Cooler Master would need to make a decent multilayer front panel PCB. Better grounding would also help! Equally, there may be a lack of high-frequency decoupling inside the USB 3.0 Flash drives too (I tried 3 different makes and they all gave problems - Corsair Voyager GT 32GB, a Pretec Rex 100 8GB and a Busbi 16GB, the Busbi USB 3.0 Flash drive had a silver 'metalic-paint' plastic case and did not seem to cause quite as much of a problem as the other two). The PCBs inside these pen drives are often simple dual-layer PCBs. So just bear in mind that if you have USB 3.0 devices AND wireless devices such as wireless mouse dongles, bluetooth dongles or WiFi dongles (or perhaps TV tuner dongles) - keep all USB 3.0 devices away from them. If possible, use rear ports for one and front USB ports for the other. If you are still having problems, try using short, well-shielded USB cables instead of connecting them directly to the system's USB ports. If they ever start making USB 3.0 versions of wireless dongles - I can see this issue becoming a BIG problem! P.S. Since sorting out this problem, I have noticed that the battery in my wireless mouse lasts for several months now instead of just a few weeks. My guess is that it had to keep re-transmitting 100's of bluetooth packets due to the interference problems and that this quickly depleted the battery. If you found this blog post useful please tick one of the Reactions boxes below. You can use a .txt file to define an alternate menu entry for each file. You can use spaces in the filename if you wish (see #4). A Beta7 version of 1.55 is available in the Alternate Downloads area as usual. It is almost ready for release, I am just waiting for one bugfix to grub4dos 0.4.6a from the developers. E2B v1.55 will complain if the latest version of grub4dos is not used. Although it may work using earlier versions of grub4dos, some bugs have been fixed recently in grub4dos (one of which was quite serious to do with writing to NTFS files not working), so a new version is 'required'. Many thanks to the E2B users who have suggested small tweaks and improvements to make E2B even better! The latest grub4dos also allows you to disable or change the ► symbol that is displayed at the side of the highlighted menu entry - see the \_ISO\Sample_MyE2B.cfg file for details. P.S. MakePartImage has also been updated to v 0.037 and now includes RMPartUSB.exe in the \e2b folder so you can restore the E2B partition from Windows using the RestoreE2B.cmd script, without needing to boot from the E2B USB drive to the CSM menu. As with most ISO files, you can just add the Desinfect 2014 ISO file to your Easy2Boot USB drive and boot from it in BIOS/MBR mode - OR - you can drag-and-drop the ISO onto the MPI Toolkit FAT32 Windows Desktop icon to make a partition image file and then add the ct_desinfect_2014.imgPTN file to your Easy2Boot drive, if you want to 64-bit UEFI-boot to Desinfect as well as MBR-boot. If you want to enable persistence however, you will need to use a special .mnu file as well as the Desinfect ISO file. Adding a persistence ext2 file allows some Desktop settings to be remembered after a reboot. For instance, any files placed on the Desktop will be preserved. However, the background wallpaper is reset to the Desinfect wallpaper after every boot. I also could not get the antivirus updates to be persistent using this method, they have to be downloaded each time you boot to Desinfect. Note: You can have persistent updates, but not with persistence as well - see the next blog post! Here is the .mnu file. The top lines are comment lines and contain instructions on how to add persistence. The .mnu file is also available in the Alternate Download Area from here. Note that the ct_Desinfect_2104.iso file actually contains a second ISO file inside it (/software/desinfect-2104.iso). It is this ISO file that we must use for the iso-scan/filename parameter. A user requested an F1 help hotkey feature, so I have added this into E2B v1.55. Help text is displayed in the console screen. It is expected that the user will want his own F1 menu, so all they have to do is copy the \_ISO\e2b\grub\ENG\F1.cfg file to the \_ISO folder and edit it to show whatever help text they want for their E2B payload files and hotkeys, etc. If you do not want a Main menu entry, but you still want the F1 hotkey to work, then you can specify a generic F1 hotkey in the \_ISO\MyE2B.cfg file. The user can then press F1 in any E2B menu and they will see the Help menu and so no Main Menu entry is needed. The F1 Help menu can be removed from the MAIN Menu by deleting the file \_ISO\MAINMENU\ZZZF1SubMenuHelp.mnu (in later versions of E2B use 'set NOF1=1' in the \_ISO\MyE2B.cfg file). V1.55_Beta3.zip is available from the Alternate Download links on the Easy2Boot Download page. The new version 1.55 of E2B recognises the .cfg file extension which can be used for changing the 'theme' of E2B (non-volatile, the change will be remembered on reboot). Any .cfg files that are in a menu folder (e.g. \_ISO\MAINMENU or \_ISO\UTILITIES, etc.) will be enumerated and listed in the relevant menu. The contents of the .cfg file should be the same as the contents of a valid MyE2B.cfg file. When you select a .cfg file from the menu, QRUN.g4b runs and copies the contents of the file to the \_ISO\MyE2B.cfg file (which, of course, must be present). The \_ISO\MyE2B.cfg file must be at least as big as your .cfg file. To change the menu entry from just listing the filename+extension, you can make a .txt file for each .cfg file (containing a 'title' entry) in the usual way or use the 'set EXTOFF=1' line in the \_ISO\MyE2B.cfg file. In this way you can switch to any 'theme' from a menu entry. To demo E2B menu capabilities or compare 'themes' see http://www.easy2boot.com/configuring-e2b/demo-mode/ for ideas. You may want to display your E2B menu in the highest/best resolution possible. For instance, some odd systems may not support 800x600 mode. I always advise you to use the most common display resolution so that the menu will appear correctly on all systems. However, you can arrange E2B so that it will cope with a variety of different systems. You will need a range of wallpaper bitmaps for each resolution (though in some cases the largest bitmap may work for smaller resolution displays). The code below can be used in a \_ISO\MyE2B.cfg menu to auto-detect the highest resolution available and then set the graphicsmode and wallpaper for that resolution. Note that the position of the menu will remain the same (unless you also add extra code - e.g. if "%GMODE%"=="1024 768 24" set rstart=5) and so will the text colours, etc. See the Sample MyE2B.cfg file for an example. So each wallpaper bitmap should be similar in colour and content because the menu position and text colours will not change. This Change_Language.mnu file will be in the Sample mnu Files folder in v1.55 and later versions. It allows the user to temporarily change the language strings (until reboot). Using this and the Change_Theme.mnu, you can demo E2B to your colleagues! You can modify it by adding or removing languages or write it in a different language other than English (save the file as UTF-8 if using non ASCII characters). echo Only the standard E2B menu entries, headings and some prompts will change. Make_E2B_USB_Drive.cmd now checks for Admin rights and also removes EFI folder to save space if you formatted it as NTFS (as you cannot directly UEFI-boot from an NTFS partition). New .imgPTNAUTO file extension supported (no user prompt to switch partitions). AUTOCSM variable in MyE2B.cfg will now cause all .imgPTN files to auto-run, just as if they all had the .imgPTNAUTO file extension. Bugfix for ISOs with long filenames ending in .isoWB. Sample WinBuilder .mnu changed for same fix as above. New grub4dos 0.4.5c grldr version. File enumeration speed improvements - should make for faster booting on systems with slow BIOSes. linux script fmt.sh added to format a USB drive as an E2B drive under linux. Slow to load the Main Menu? 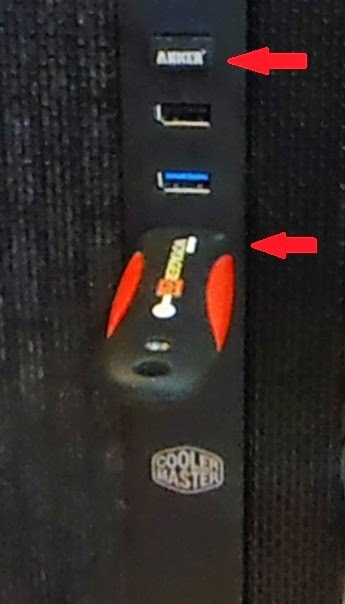 Several people have reported in the E2B forum that E2B takes several minutes to get to the Main menu even when using a fast USB 3.0 flash drive. This is due to the particular system BIOS having very poor quality USB 'drivers' which makes USB communication very slow. Because E2B needs to access all files in the \_ISO\MAINMENU folders and \_ISO\WINDOWS folders several times during start-up, this can result in a long wait on systems with these slow BIOSes. The speed does not depend on how fast the CPU is or how fast the USB drive is (though that can affect timings), it depends on how well written the USB driver code is in the BIOS (good code will use interrupts and DMA, bad quality code will use polling which can cause long delays as each USB bus 'message' is sent or received). Because BIOS vendors tend to use the same code modules for different systems, you may find that the same 'family' always have poor USB performance (e.g. AWARD V6.00PG BIOS). Of course, once you boot to an Operating System such as linux or Windows, the OS uses it's own USB drivers and we will get decent USB communication speeds. You can now run a 'Measure USB Performance' test from the Utilities menu (which is really measuring the BIOS USB driver performance as well as USB speed!) to see how long 100 file accesses takes (and also 1000 file accesses). You should see that most systems take between 2-5 seconds for 100 accesses, but slow BIOSes can take 60 seconds! Note that this test does not measure data transfer performance, just directory access speeds. Also, grub4dos produces faster results on FAT32 USB drives than on NTFS drives, so if comparing times between different USB drives, always use the same formatting for E2B. An indication of a BIOS problem, is that booting to E2B using the RMPrepUSB - QEMU button (which is normally much slower than a real system) is faster than when booting on the real 'bad' system using the system's BIOS USB code. QEMU is normally slower than a real system. On an EeePC (an average BIOS), the same USB drive - 100 loops=3 seconds. To check for a bad BIOS, boot to E2B on the 'bad' system, and then switch to grub4dos 0.4.6a (it is listed in the Main menu) and then load the grub4dos 0.4.6a USB 2.0 chipset driver (which is listed in the Main menu after loading 0.4.6a). If the USB driver loads successfully and detects your USB drive, you can repeat the 'Measure USB Performance' test to see if file access speeds have improved. Typically, 100 accesses will take less than 2 seconds when the grub4dos USB driver is loaded (if it has recognised the USB 2.0 chipset in the system)! 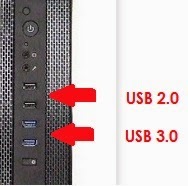 You can use a USB 3.0 drive, but it must be connected to a USB 2.0 port. Unfortunately, the grub4dos USB driver does not recognise all USB 2.0 chipsets/adapters and so it is pot luck whether it works or not on each system. If the grub4dos USB driver does work, you can enable it on each E2B start-up by setting a variable in the \_ISO\MyE2B.cfg file (set GRUB_USB=Y). If the grub4dos USB driver does not recognise your chipset or for tips on getting E2B to load faster, see the FAQ page. If you already have an earlier version of E2B, just download the smaller 1.54 (non-DPMS) version and overwrite the files on your E2B USB drive. As you may know, E2B and most of the Tutorials on www.rmprepusb.com use grub4dos. I have got to know grub4dos pretty well and I love it's flexibility. It has been improved quite a bit in the last few years (thanks chenall and tinybit!) and there have been some changes which have not been reflected in previous documentation or guides. Tutorial 21 is a grub4dos tutorial - useful for beginners and the more advanced user. Tutorial 71 is about some of the programs which you can run under the grub4dos environment, such as wenv, hotkey, chkpci, fat and bios. It also describes how to run grub4dos batch files. Tutorial 57 is about configuring grub4dos menus, hiding startup messages, making a silent splash screen, configuring 'secret' keys, etc. Finally, Here you will find a page about the special hidden, secret and undocumented features of modern grub4dos, also what memory areas grub4dos uses, what internal variables are available, new commands and operators, the undocumented Fn. functions calls and lots of other goodies! If you want to get a feel for grub4dos batch files, have a look at any of the Easy2Boot grub4dos batch files (they usually have a file extension of .g4b) - an advanced coding example can be found in the dpms2.g4b batch file if you are feeling really geeky! The latest version now includes a fmt.sh bash shell script which can be run from a linux OS and it will format a partition as FAT32 on the specified drive, copy over the E2B files and then run bootlace to install grub4dos. There is also a fmt_ntfs.sh script to create an NTFS E2B drive (v1.83+). I have tested it in a VM (VBox) using Linux Mint Debian Edition (64-bit) and Ubuntu 14.04. Of course, there are lots of linux distros and it may not work on all of them. As it formats a partition, you need to be careful when using it - you have been warned (but it has been independently tested here)! The E2B download is on this page (linux users will probably not need to use the much larger DPMS version which you will only want if you are intending to install XP from E2B). Once you have made your E2B FAT32 USB drive, just add all your ISO files to any one of the menu folders - e.g. \_ISO\MAINMENU or \_ISO\LINUX. Alternatively, you can add your payload files into the downloaded files first, before you run the fmt.sh script. This is useful if you want to make a fresh, contiguous E2B drive and it is often quicker to make a fresh drive, rather than running defragfs to make any added/changed files contiguous. Here is a screenshot of the script in action. You need to run chmod first before you can run the script. The script can be found in the \_ISO\docs\linux_utils folder after extracting the files from the download (the folder also contains defragfs which you can use to make your ISO files contiguous - only works on FAT32 volumes). E2B v1.83+ includes a fmt_ntfs.sh script to format a drive as NTFS, plus the udefrag utility to defragment an NTFS drive. Read the ReadMe file for details.